Kevin T. Kelly and his son, Jack Kelly, are in the same line of work. They are artists; they make paintings. 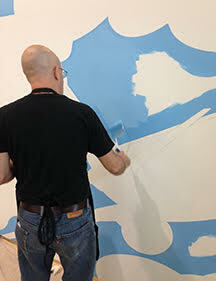 This is often a solitary craft, practiced in the studio, possibly alone. 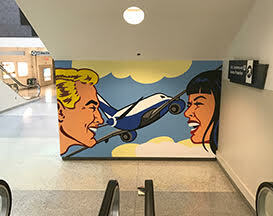 Their recent project at the Cincinnati Northern Kentucky Airport was not at all like that. 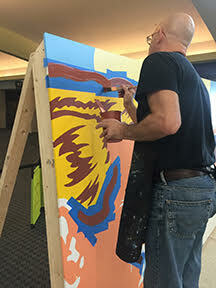 They worked twelve ten-hour days (9 a.m. – 7 p.m.) in Delta Concourse B on two murals, each on a huge panel of MDO board – “Sign painters’ board,” says Kevin, referring to its composition to resist the elements while offering a receptive surface for paint. 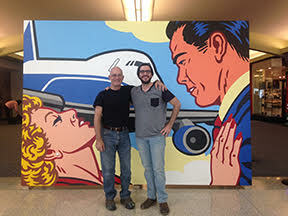 One panel is seven feet by eleven feet, the other eight feet by eleven. 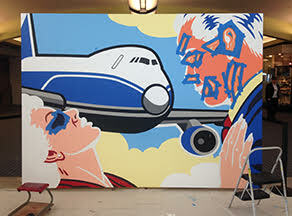 Both are titled “Love Is In The Air”; each shows the shoulders and head of a man and of a woman, an airplane in the background between them. One, the one where the smiles are broadest, represents arrivals; the other, also smiling but wistful, signifies departures. 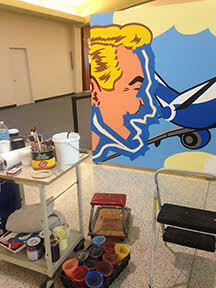 The murals are in the Neo-Pop style Kevin developed as a result of working for Pop master Tom Wesselmann. As a young artist he was an assistant in the New York studio of that former Cincinnatian, learning things he would put his own stamp on. His son is no doubt doing something of the same, right now, as his father’s collaborator. 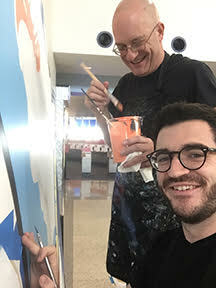 The father and son have contrasting looks: Kevin shaves his head and wears wire-rimmed glasses; Jack has dark hair and beard and wears dark rimmed glasses. Both are tall but Jack is taller. 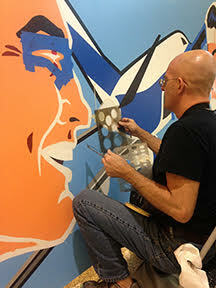 We talked in Kevin’s Walnut Hills studio, where his non-Pop paintings are perhaps more numerous than the Neo-Pop. 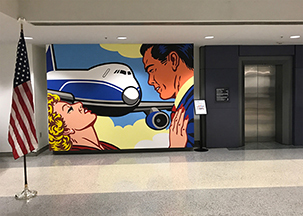 They are diametrically opposite to Pop, landscapes without human presence, once described to me by the artist himself as “like Zen meditation.” Unsuited, of course, to airport décor, where meditation might mean you miss your plane. 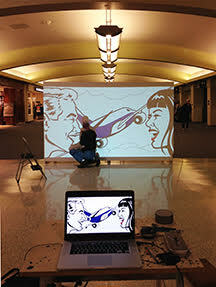 Painting in public by the two of them meant a generous amount of input from those passing by. As a result, Kevin and Jack now know that kids as young as pre-kindergarten are well informed about airplanes and can identify them. A woman from India talked with the two artists at some length; she was going through a divorce, found the paintings rewarding to look at. 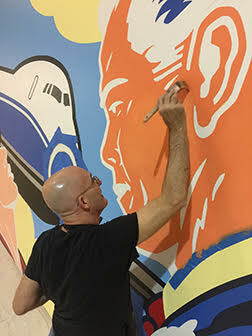 “Art has the ability to affect people if they will take the time,” Kevin says. “We had music going, early ’90s work, also big band, Bobby Darin, Frank Sinatra – loud and fun stuff. Few people were rude. . .it was fun to talk to them.” One passenger, who had stopped by a bar to fortify himself for flying, would have been pleased to take brush to panel himself, but in the end brought them a Snicker bar and apple juice. 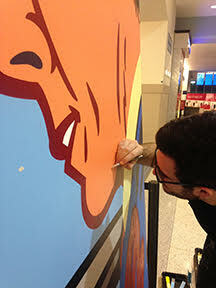 A complication when working in an airport is that at first everything had to go through security, coming and going – not easy with panels measuring seventy-seven and eighty-eight square feet, plus paints and brushes and so forth. Arrangements were soon made to leave everything at night in an empty commercial space and coming and going became vastly easier. Jack, asked when he knew he wanted to be an artist, says “it was always sort of there.” He graduated from the Columbus College of Art and Design last May and considers that his father has been “a huge influence” in shaping how he thinks about art. 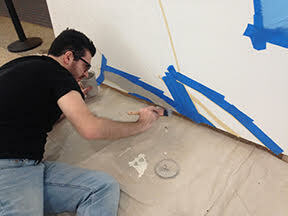 “Being around it has a subconscious impact.” His formal college art training was pointed toward illustration rather than fine art, he says, but that was a conscious decision leaning toward practicality and he mentions his adviser at college as “awesome.” But also – “Dad’s work made more and more sense. Structure is important.” Kevin, a graduate of the Art Academy of Cincinnati, was on the faculty there for ten years so knows something about imparting art skills as well. The marriage that produced Jack did not last and he has lived in Columbus with his mother much of the time since it ended. 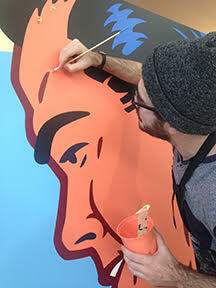 Last summer he moved to the Cincinnati area and is working for a graphic apparel company named Ripple Junction. Graphic apparel is a new term to this writer, but it’s easily googled and turns out to refer to imprinted tee shirts, back packs, etc. Obviously, Ripple Junction needs artists on its staff. Jack’s goal after he finds satisfactory housing here is to have his own studio. “Now it’s basically the bedroom,” he explains. 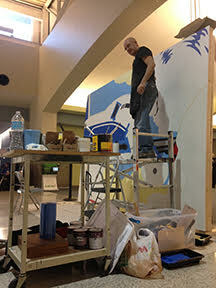 Those long days at the airport were tiring and “you have to be really focused,” Kevin says. “But it was fun.” My notes don’t indicate whether it was father or son who added the last bit. Either one of them could have.